Clamping Down on Paying to Play...by Horse Show Officials! How X or Y judge ever got appointed – especially in endurance where so many seem afflicted by selective myopia – will always be the subject of gossip between riders who feel that decisions affecting them and/or their friends are unfair. But confirmation that “some” officials pay-to-supervise-play came to the FEI’s attention during (undisclosed) proceedings at the Court of Arbitration for Sport. How can the FEI prevent it, though? Such sweeteners won’t exactly be flagged up in the show’s accounts; even if they were, I am not sure the FEI has time or authority to sequester financial records of the many hundreds of fixtures it affiliates each year. 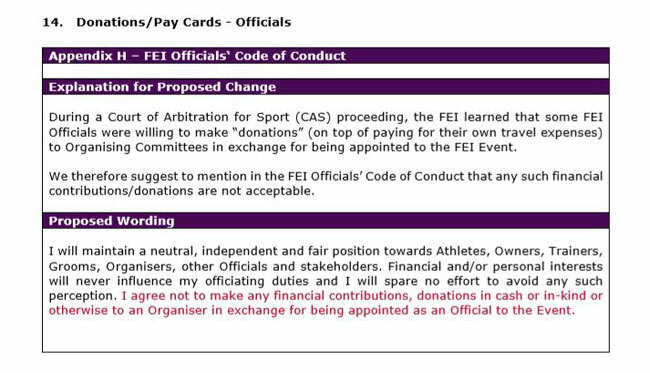 As a quick fix, the FEI wants officials to Promise Not To Offer Bribes (ok, that’s not exactly what it says) in a revised code of conduct. Screenshot from the FEI Regulations. The use of the term “pay cards” is a tad strange, btw. Jumping rules have always allowed organisers to issue “invitations” to a few special riders of their choosing, and in this context pay card means “making sure you get one by inflating your entry fee to more than the average Joe earns in a year.” But a pay card for officials has different and rather more sinister connotation altogether. Another important new rule will heavily rely on the integrity of officials to have the intended impact. As reported here, and widely elsewhere, the FEI eventing committee has taken a forensic look at whip abuse and blood rule. One consequence is a proposal to double the automatic suspension triggered if you receive two yellow warning cards within 12 months. Now you’ll be grounded for four months instead of two, and this will apply to all disciplines, not just eventing. I have never thought the two-month ban is sufficient, especially if it neatly falls in the “closed” or less active season. But a four-month ban is really significant, and might make a less-than-impartial judge think twice about issuing a yellow card to a rider he knows personally, instead applying one of the lesser sanctions not subject to totting-up. Another interesting development is eventing’s wish to tailor sanctions specially for the emotive issues in its particular sport. This isn’t really supposed to happen: in all my scrutiny of desert endurance, I’ve repeatedly discussed the hopelessness of the general 30-minute deadline for lodging protests about rule-breaches. The FEI usually counters that its hands are tied: the sanctity of the field-of-play decision applies equally to all sports, be it the goldfish bowl of vaulting or the middle-of-nowhere-ness of endurance. So while a dressage rider causing a bleed or a jumping/eventing rider whipping his horse will be pulled up, an endurance rider 10 or 20 kilometres from the nearest judge usually gets away with accepting unauthorised assistance, lashing his horse with extra-long reins, taking a short cut and interfering with his GPS transponder, or swapping horses etc. By the time the sharp-eyed observers watching the ride livestream from another continent manage to alert anyone, it’s simply too late. Eventing now wants is the facility to convert two “recorded warnings” for blood in a three-year period to a yellow card. The FEI legal department is considering how to go about this, because it means FEI HQ and not the ground jury will be handing out a field-of-play sanction – and long after the event too. If this goes ahead, it surely opens the door for more bespoke ways of sanctioning the shenanigans in other sports? Meanwhile, there is disappointment in the “Clean Endurance” community that the FEI has dropped its research-based proposals to cap high speed – presumably due to bullying by the UAE; more of that on another occasion. Though there’s a new measure which could stop suspended dopers in any horse sport continuing to participate by simply donning a different hat, and it could be useful for endurance in particular. Because of the way the UAE’s vast endurance operations are structured, if a rider is suspended he just carries on as a “trainer.” He can even help his fellow at a competition by shouting instructions from the following motorcade – as long as he doesn’t set foot on the field-of-play itself. Not that it stops some people. One infamous serial offender was the Emirati Ali Al Muhairi, then boss of the SAS endurance barn of Sheikh Mohammed’s brother, Sheikh Hamdan senior. He came to doping prominence with a suspension in 2009 for an Etorphine offence (the banned drug vets used to use to drop an elephant). In 2011, not long back in action as a rider, Al Muhairi was provisionally suspended again, for a steroids positive. While awaiting his Tribunal hearing, Ali was spotted on the field-of-play at the 2011 FEI National Day ride at Al Wathba – not easy to deny as he was pictured on the podium in the local paper, as trainer of the winning horse. This breach of suspension was taken into account when in 2012 he was handed a record four-year suspension for the steroids offence. But it seems he still couldn’t resist joining in. Two new instances of entering the field-of-play – at Euston in the UK and another at Al Wathba, where he again stepped onto the podium, this time as “representative” of the sponsor – sat unjudged on the Tribunal’s “pending” list for a couple of years. A tricky one: his duty to “carry out the wishes of a member of the ruling family of Dubai” was somewhat pivotal to his defence. Al Muhairi can’t stay away from the Field of Play. 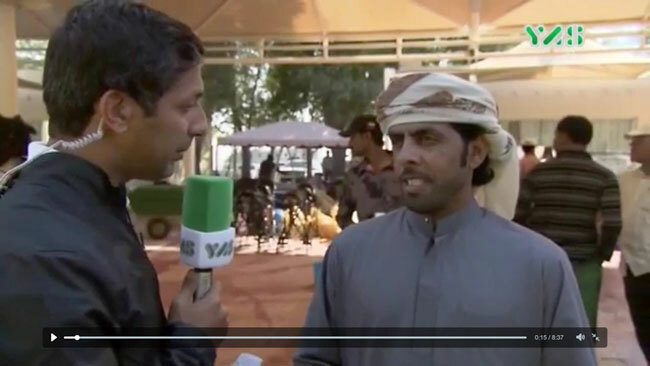 And here (above) is a picture of Ali being interviewed by Dubai sports broadcaster YAS in January 2016, while still suspended, in the environs of the vet-gate at the Al Reef Cup. It’s hard to think of any other sport that celebrates its dopers: some will recall the comedy moment in 2013 when Ali was picked as poster boy for the 2014 WEG! Now a new proposal could stop suspended persons being on site at all – even as a mere spectator. Explaining the new rule, the FEI says: “There are certain venues/disciplines where spectators may have access to/get close to the Field of Play and the FEI wants to be able to prevent certain suspended persons having such access.” The wording is not as all-encompassing as the “warned-off” rule applied by most Thoroughbred horseracing jurisdictions, but it’s a start. All new rules for 2019 are now out for consultation with the national federations. They must respond by August 31, 2018.